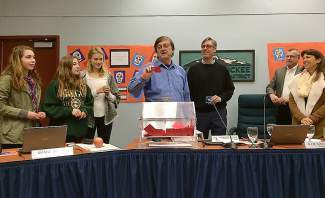 Truckee High School students Abbey Mason, Nicole Burson and Kayla Redner, left, watch as Charlie Riley, center, pulls a name from the raffle drawing, while Mike Murphy, Rob Leri and Kim Szczurek look on. 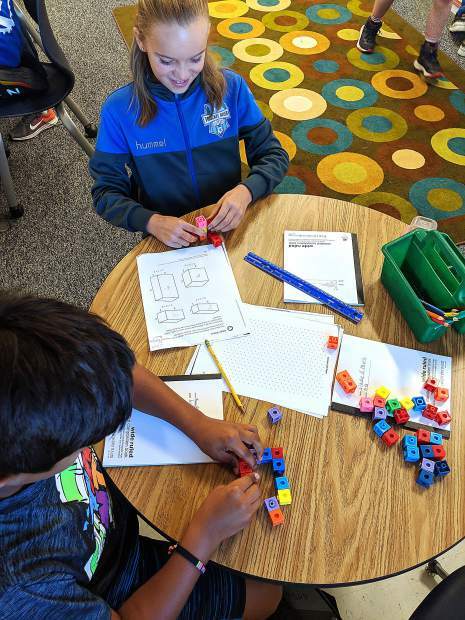 TRUCKEE, Calif. — The Truckee High School Booster Club has been busy raising money for its 2016 Project Graduation. Just before TTUSD held its December board meeting, Charlie Riley from Sears Hometown Store and Mike Murphy, Booster Club President, visited the school district’s main office to hold the drawing of the winners of the Booster Club Project Safe and Sober Graduation Raffle. The raffle was the first stage of fundraising for the 25th annual Truckee High School Project Graduation. Project Graduation is a program offered by many high schools in the United States, in which organized, adult-supervised and alcohol-free activities are offered as part of a post-graduation party, as an alternative to student-run events involving alcoholic beverages or other drugs. For the past eight years, Nancy and Charlie Riley, owners of Truckee’s Sears store, have donated a Samsung TV ($650 value) for a prize to raise money for Truckee High’s annual Project Graduation festivities. This year’s Project Graduation volunteers sold about 460 tickets at $10 each, raising about $4,600 through the raffle. Additional fundraisers planned throughout the year include a fashion show/silent auction, a spring raffle for a barbecue grill, and a variety of other events. Donations can be sent any time to Project Graduation, PO Box 583, Truckee, CA 96160. For more information, email the Booster Club at truckeehighboosters@yahoo.com.